I received my Master’s degree in Conflict Transformation in April 2008. In the summer 2008 and 2011, I acted as a facilitator in the dialogue/film camp for Palestinian, Israeli and Canadian youth called Peace It Together, and was fortunate enough to be working with fellow CJP alumni Aaron Lyons (2008 and 2011) and Fadi Rabieh (2008). In November 2008, I became the Restorative Justice (RJ) Coordinator for the Provincial Government of British Columbia, housed within the Ministry of Public Safety and Solicitor General. This position was created to help achieve a connected and coordinated vision and strategy of RJ in B.C., focused on community-government collaboration. Since 2015 I have also been acting as a Community Program Manager within government for Victim Services and Violence Against Women Programs. 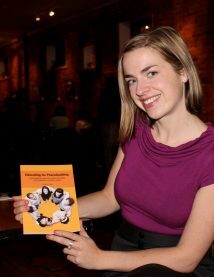 In addition, I am a principal with Just Outcomes (www.justoutcomesconsulting.com) alongside Aaron Lyons and Matthew Hartman. Some background: Catherine has been working with community RJ programs since 1999. She is recognized across BC and Canada as an expert consultant, trainer and practitioner for RJ programs. Since 2002, she has provided training to over 1500 youth and adults on RJ in various settings including schools, faith groups, government and non-government organizations. “Prior to her work in BC, she served as the Victim Offender Mediation Program Coordinator in Edmonton and as a Restorative Justice Educator for Mennonite Central Committee in Alberta and B.C. Catherine loves meeting new people, yoga, camping, cycling, and group-dancing in public to Michael Jackson’s “Thriller”.